“What do customers think about you and your work?” Ever pondered the answer to this question, as a business? We all strive to give our customers the best that they could have asked for, and beyond. And it is always nice to be recognized for the work that you do. Who doesn’t like to be told “you are doing a good job”, right? 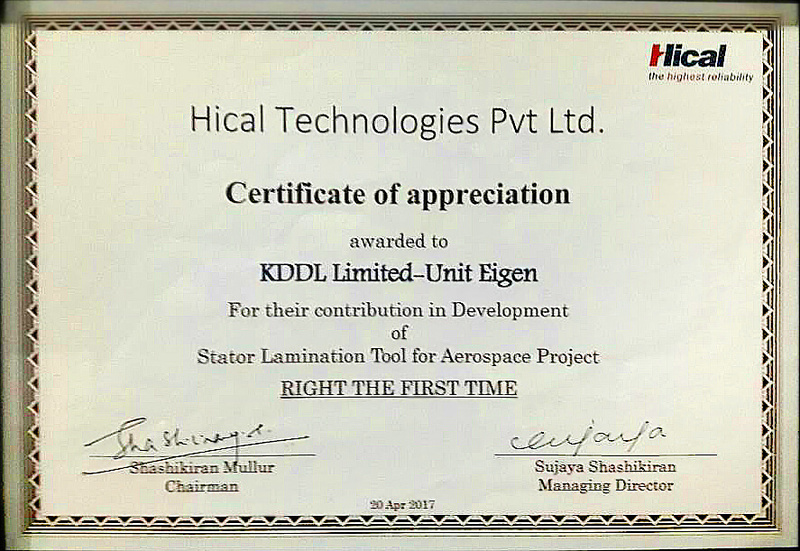 KDDL Limited – Unit Eigen is delighted to announce that we have received one such Certificate of Appreciation from one of our clients, Hical Technologies Pvt. Ltd., for getting it “Right the First Time” in developing a stator lamination tool needed for one of their aerospace projects. Hical Technologies designs and manufactures high reliability electromagnetic and electromechanical components such as motors, solenoids, sensors and transformers. They also offer system integration services, such as box builds and cabinet integrations to some of the world’s leaders in Aerospace, Railways and other such cutting edge technology specialists. Hical was established in the year 1988, and have been a 100% exporting unit since the year 1997, growing rapidly ever since to emerge as one of the key suppliers to leading manufacturing corporations across Europe, United States and Asia. A note of appreciation and the recognition received from such an industry leader and veteran, makes it that much more special. We are deeply humbled by this honor bestowed upon us. This recognition stands testament to our technical prowess, and ability to create a product without revisiting the drawing board again and again. This certificate from Hical has enthused us to better our efforts, and continue to please our clients with the best of our service. We would like to affirm our clients at this juncture that we will raise the bar higher, and strive harder to continually excel in what we do.